Yet many find themselves abandoned, abused or homeless in circumstances that just aren’t their fault. We have been rescuing, caring for, rehoming and supporting these dogs since 1965. Our dedication, passion, support and tenacity to keep making this happen hasn’t dimmed at all, but many of our facilities are no longer at the high standards we want for our animals. Margaret Green Animal Rescue (MGAR) has an ambitious plan to improve the lives of the dogs they care for at Lincoln Farm Rescue and Rehoming Centre. June sees the start of the much needed improvements to two of the Kennel areas at our Lincoln Farm Rescue and Rehoming Centre near Bere Regis. The works which will cost around £165,000 are being carried out to improve the facilities for the dogs in our care throughout the year. The new kennels will offer a cooler environment in the summer and warmer in winter, and better sound insulation, which is very important for our dogs who may be struggling with their first few nights in a strange place. It will also mean the time currently taken to clean the outdated kennels will reduce, leaving the team with more time to spend with the animals, as the design includes improved disease control with the use of easier clean surfaces. The design changes will also make a huge difference to some of our dogs, with the introduction of the new side door, dogs will no longer need to be walked past each other in the corridor, which can be very stressful and upsetting. The new design also brings much greater flexibility of use for the centre than previously which allows another fundraising stream. The multi-use blocks will be easily split allowing boarding for dogs in some sections. Boarding is an important source of revenue for the charity, ensuring it remains sustainable into the future, and the flexible use of the blocks will mean that we can continue to meet our values for our rescue dogs too. Every 500 people who donate £20 takes us £10,000 closer to our target - please could you help? 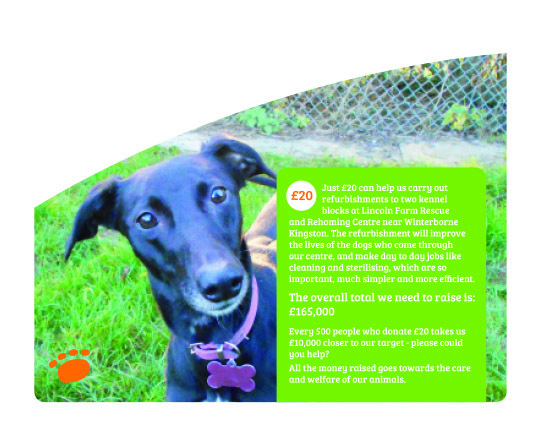 All the money raised goes towards the care and welfare of our animals.